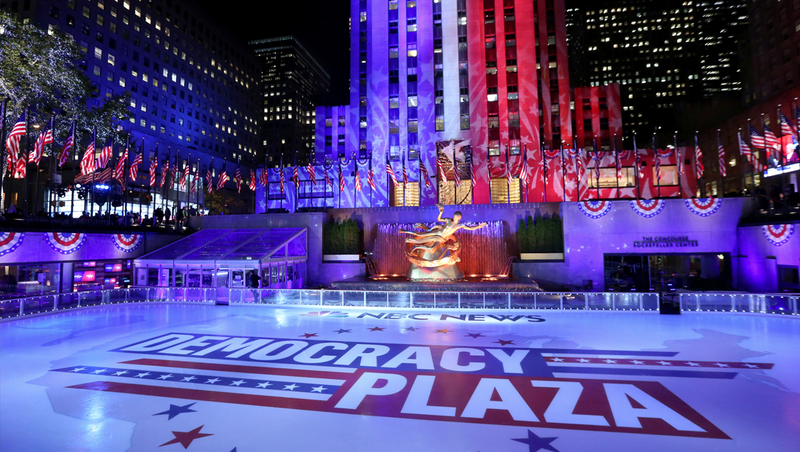 NBC News and MSNBC are bringing back Democracy Plaza for midterm election night. The plaza, which will coincide with the network’s new “The Vote: America’s Future” branding, will transform Rockefeller Center into a full experience lit in red, white and blue and featuring live programming screens added throughout the outdoor space. 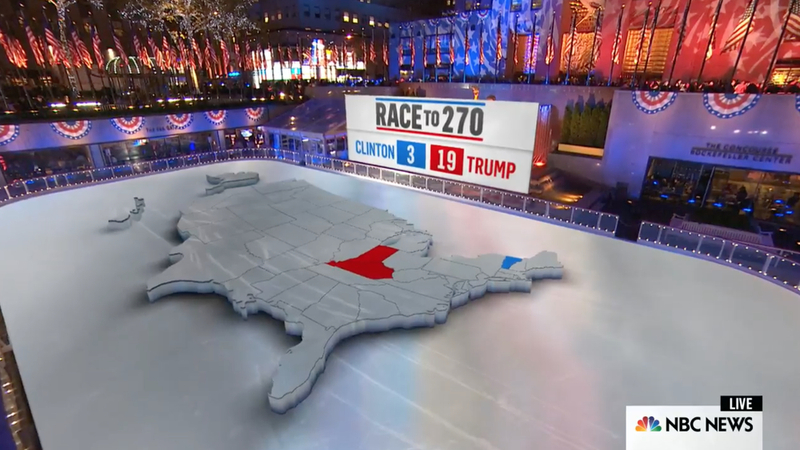 The augmented reality electoral map on Rockefeller Center’s ice skating rink used during the 2016 elections. The center’s ice skating rank will be replaced with an augmented reality map, much like during the 2016 elections. “NBC Nightly News” anchor Lester Holt and “Today” co-anchor Savannah Guthrie lead the network’s coverage joined by “Meet the Press” moderator and NBC News political director Chuck Todd and “Megyn Kelly Today” host Megyn Kelly for live coverage from 9 to 11 p.m. eastern time. On Sunday, November 4, “Meet the Press with Chuck Todd” originates live from NBC News Election Headquarters in New York with an all-star political panel of NBC News and MSNBC anchors and contributors. “Today” will provide full coverage with Savannah Guthrie and Hoda Kotb on Election Day and the morning after. “NBC Nightly News with Lester Holt” broadcasts from NBC News Election Headquarters on Monday, Nov. 5 and Tuesday, Nov. 6. They will be joined throughout the night by “Deadline: White House” host Nicolle Wallace, “Hardball” host Chris Matthews, “All In” anchor Chris Hayes and “The Last Word” host Lawrence O’Donnell. Kornacki will be on set breaking down the details of key races with his now famous “Big Board,” which re-launched with an all-new look using cutting-edge software developed by the NBC News Digital product and technology teams. MSNBC anchor Katy Tur will host a pre-show airing across all NBC News digital properties from 7 to 9 p.m. with NBC News coverage simulcasting afterwards and through the night. NBC News correspondents Catie Beck, Garrett Haake, Kasie Hunt, Chris Jansing, Steve Patterson, Cal Perry, Morgan Radford, Gadi Schwartz, and Jacob Soboroff as well as NBC News political reporters Shaquille Brewster, Leigh Ann Caldwell, Vaughn Hillyard, Mike Memoli, Heidi Przybyla, and Ali Vitali will report live from key locations across the country, focusing on the candidates and the crucial issues impacted by 2018 midterm results. NBC News senior legal and investigative correspondent Cynthia McFadden will embed with the NBC News VoteWatch team reporting on election security. NBC News Digital’s full politics team will be providing coverage of the race results and ballot initiatives across the country. They’ll offer exit poll data and analysis on the consequences for Donald Turmp and each party and will also provide live blog coverage of the night. NBC social teams will be live on Twitter, Instagram and Facebook with race results, data, speeches and on-the-ground updates from NBC News reporters around the country. And, NBC’s “Stay Tuned” Snapchat and Instagram Stories newscast will be covering the races with additional breaking news updates to their show throughout the night. Digital will also showcase a new interactive map on NBCNews.com powered by the same technology used by Kornacki and Todd, allowing viewers to follow the vote count on television and on their own by selecting district combinations to see how the balance of power in the House may shift.